I have created a form (https://www.jotform.com//?formID=63059395578168) that contains a number of calculated field. For some weird reason I however can't get one of the fields to calculate correctly. Specifically, i would like the field named "Late payment penalty and interest due" to be populated with a specific value whenever the value of the prior field named "# of months delinquent on taxes for this specific quarter (round up to nearest whole month)" has the value 1. Despite spending hours on it, I can't figure it out. Can you please help? 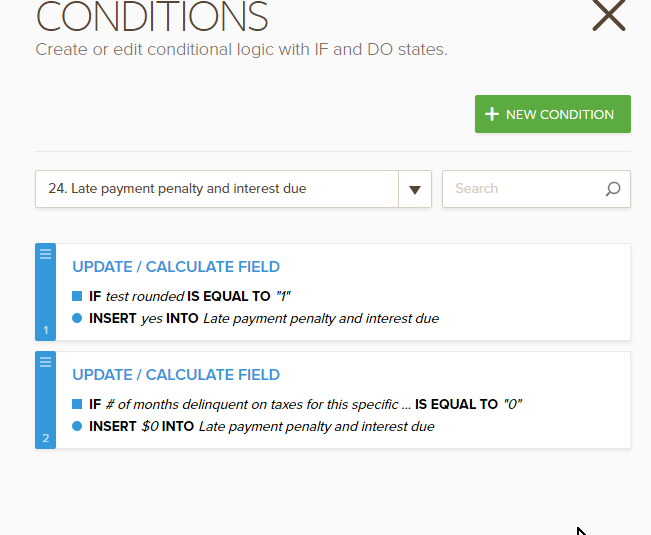 Could you please elaborate what exactly the rules or conditions you want to execute for the field "Late payment penalty and interest due"? 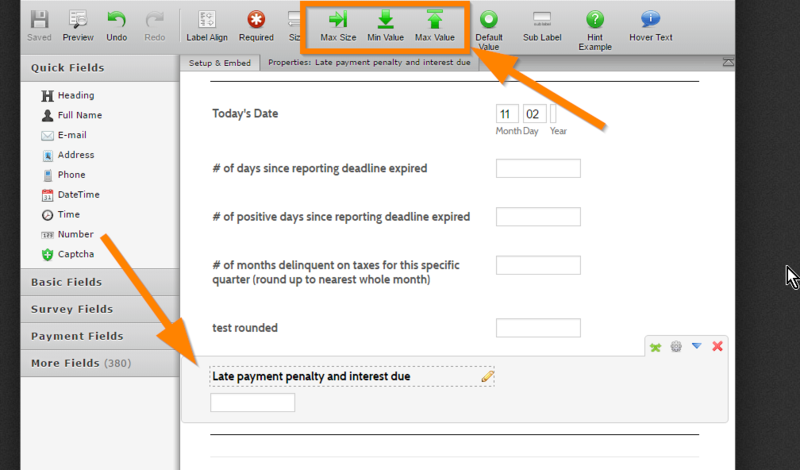 IF "# of months delinquent on taxes for this specific..." is equal to "1"
INSERT "yes" to "Late payment penalty and interest due"
IF "# of months delinquent on taxes for this specific..." is equal to "0"
INSERT "$0" to "Late payment penalty and interest due"
Noticed the options "Max Size", "Min Value" and "Max Value", these options are only applicable to numbers. You cannot insert non-numeric characters like "yes" or "$0" using conditions on that field because they are not absolute numbers. If you wish to insert a combination of alphanumeric characters, then you will need to use the "Text Box" instead, you can find the text box field under the "Basic Fields" section. Let us know if that helps resolve the problem.